TGIF! The weekend is here, and it’s a perfect time to join us on the TAMO Terrace and have a perfectly crafted cocktail and cheers to the weekend. While at Seaport tonight, be sure to head across the street to the World Trade Center and get your last chance to view our very special guest. 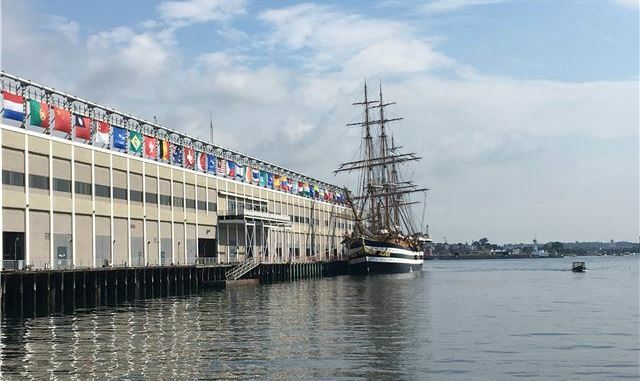 The official training ship for the Italian Navy, the Amerigo Vespucci, will offer free tours as part of Sail Boston’s Visiting Ships program. The 330-foot tall ship did not participate in last month’s Sail Boston festival due to it being stationed in Canada at the time. It last visited the Hub in 2000 during part of that year’s Sail Boston festivities. Tours are offered Friday from 3:30PM to 5:30PM, but these hours can change at the discretion of the captain. Be sure to stop by even outside of tour hours to take in the sight of this incredible piece of maritime history before she leaves for New York on Saturday!